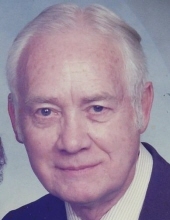 Earl J. Breuning, 100, of Peru, passed away Wednesday, February 6, 2019 at Manor Court in Peru. Funeral services will be held at 11:00 AM Saturday, February 9, 2019 at the Zion United Church of Christ, Peru with Rev. Alex Garncarz, pastor officiating. Burial will follow in Peru City Cemetery with full military rites conducted by the Peru Veterans Memorial Group. Visitation will be from 10 a.m. to 11 a.m. Saturday at the church. Arrangements are entrusted to the Mueller Funeral Home, Peru. Mr. Breuning was born February 10, 1918 in Peru to Ernest and Emma (Lange) Breuning. He was a graduate of LaSalle-Peru Township High School and attended the University of Missouri. He married Dorothy A. Jackson on September 5, 1948 at the Zion United Church of Christ, Peru. Mr. Breuning was a veteran of the U.S. Army Air Force, serving as a gunner on a B-17 in the European theater of World War II. He served in 13 missions and received the Air Medal with cluster and the European Theater of Operations Medal with 13 battle stars. He was retired from the nail division of W.H. Maze Co., Peru after over 50 years of service as a office manager and purchasing agent. He was a member of the Zion United Church of Christ, Peru, where he was active in the church choir, the Veterans of Foreign Wars, and was an original member Illinois Valley Community Hospital Red Coats, coached Peru Little League for many years and the LaSalle Elks where he was active in supporting the Elks Crippled Children’s Clinic. Survivors include two sons, Scott (Pam) Breuning of Morris and Barry (Leian) Breuning of Peru; five grandchildren, Jeffrey (Jennifer) Breuning of Normal, Elizabeth (Scott) Ruttencutter of Sun Prairie, WI, Timothy (Julie) Breuning of Troy, IL, Elecia (Ryan) Lindenmier of Arlington, IL and Elyse (Justin) Boroski of Dalzell; and 8 great-grandchildren, A.J. Breuning, Alex and Allie Ruttencutter, Kamilla, Michael, Lucy, Ellie Breuning and Evelyn Lindenmier. He was preceded in death by his wife, Dorothy on December 15, 2005; his parents; and one sister, Lila Muzzarelli. Pallbearers will be his grandchildren and his grandchildren’s spouses. Memorial donations may be directed to Zion united Church of Christ, Peru. To send flowers or a remembrance gift to the family of Earl J. Breuning, please visit our Tribute Store. "Email Address" would like to share the life celebration of Earl J. Breuning. Click on the "link" to go to share a favorite memory or leave a condolence message for the family.